The Comedy Central Renaissance is as strong as ever. Kroll Show, Broad City, and Inside Amy Schumer got a new sibling this season. Review has a simple enough premise that it doesn’t seem to have any legs: instead of reviewing movies or books, a man gets a show and reviews life experiences. This is enough for a self-contained cartoon. Luckily, Review goes way beyond the initial promise of its premise. We could use more of that in this world, because very few TV shows and films ever do. 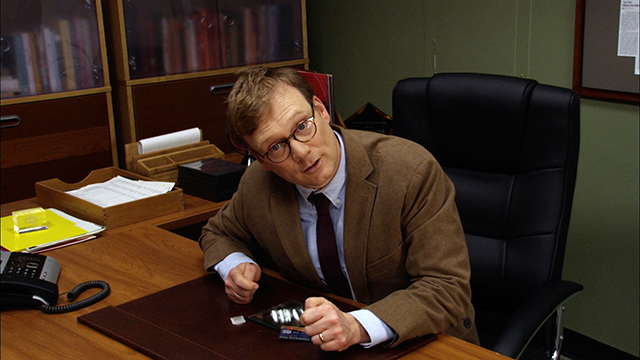 Review stars Andy Daly as life reviewer Forrest MacNeil. As his name suggests, Forrest is the dweeby stereotype of a critic. He’s has glasses, hair parted to the side, and the plainest looking suit you can imagine. He looks about as straight edge as any person could be. That makes it all the funnier to see him put into situations where he’s fighting either the law or his own insanity. Review is more than just a concept: it’s a character study. Much has already been said about the third episode of Review, in which Forrest must review divorce and therefore has to divorce his wife. Usually, a show won’t pull a gut punch like this until much later in its run, when viewers are comfortable with the world and are ready for something to change. It might help that it was based off an Australian show with the exact same concept, but Review had the confidence to get serious so quickly. Then, it had the chutzpah to sandwich that divorce between two different pancake eating contests. Only Forrest MacNeil could turn a challenge to eat 30 pancakes into some cosmic event that connects to the human experience as a whole. If Review had been made by anybody else, each episode might have existed in a bubble. In some shows, characters can cause damage and blow giant amounts of money. In the next episode, it is as if none of those things actually happened. That is not the case in Review, though. When Forrest spends $70,000 on a date with Ashley Tisdale at a charity auction, he is still in debt the next episode. When his car gets stolen after a fit of road rage, it is never to be seen again. To watch Review is to watch a man’s life completely unravel before his eyes, and it is all his fault. This all sounds really dark because Review is really dark. Yet, it is the darkness that makes the show so funny. In the episode where Forrest must go to space, a tragedy that occurs while amongst the stars is funnier than it has any right to be. And the joke keeps going on and on. The further it goes, the funnier and more uncomfortable it ultimately gets. Review very rarely relies on simple one-liners. It is the kind of show that gets funnier on repeat viewings. In a very short time, it has also built up a huge cast of unique characters. It is always such a joy to watch Forrest go from uptight to unwound in a matter of seconds. Meanwhile, the supporting cast is solid, too. Just watch the way Megan Stevenson (who plays Forrest’s co-host A.J. Gibbs) reacts every time Forrest comes back from one of his field assignments. Their awkward chemistry is one of the most underrated parts of the show. Review explores consequences in a way that few comedies ever do. If you want to live the fullest life possible, then you’re probably going to lose all of your money and develop a coke addiction. Review took a concept that could have gone stale quickly and made it endlessly entertaining. The show ended this season on an odd note. It is the kind of plot point that seems tough to get out of. There has only been one season of Review but at this point, I trust Andy Daly and crew with just about anything. This entry was posted in Uncategorized and tagged Analog This, Andy Daly, Comedy Central, Review on May 2, 2014 by ian0592. God, it’s so brilliant. Easily the best show CC has aired in years. Andy Daly is like a much more naturalistic Martin Short. He’s got a bright future. I hope Comedy Central doesn’t bail on this show. I really want to see more of the continuing adventures of Forrest.